Every year, I resolve to be healthier. Sometimes, I need to work on my exercise. Sometimes, I just need to remember my vitamins. And other years, like this year, I really need to improve my eating habits. Not only do I need to be a better role model for my daughters, but post-birth fertility is on it’s way. I need to replenish the nutrients that baby removes before the next pregnancy! 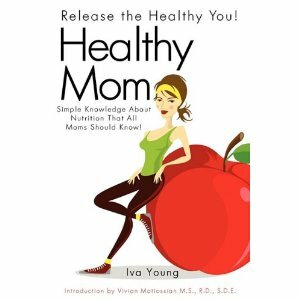 In the summer, I was sent a copy of Healthy Mom: Simple Knowledge About Nutrition that All Moms Should Know by Iva Young. Healthy Mom is a primer about everything you need to know about food. Ms. Young doesn’t just provide a guide to macronutrients and food groups. She includes information about how the digestive system works, how to read labels and how to choose the best food possible, even including brand names & where to buy. She explains the food pyramid and the diabetic exchange diet. And Ms. Young doesn’t just throw you out of the nest. She offers worksheets for using the diet for nine different calorie levels, as well as meal plans and recipes. There are many things I like about this book. First, she is a real advocate of variety and moderation of everything. Healthy Mom also provides excellent information on the nutrition & benefits of food, herbs, etc. Ivy Young suggests use of the diabetes diet, which I’m a total fan of and have used before. I also liked the worksheets and charts that make the diabetic exchange diet a cinch to put into practice. As with all books, I didn’t agree with everything. I disagreed with her views on soy, which is a known estrogen mimicer. I also wasn’t sure about her thoughts on xylitol–I need to research that further. Overall, though, I thought this was a great book. I will be using a number of tips in this book to increase the nutrition in my diet. Anyone who is looking to eat less processed food or just eat a more balanced diet, could benefit from using Healthy Mom.